What a great way to start a Thanksgiving! 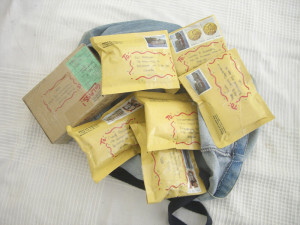 This is the bundle of packages I took to the post office this morning. I’m very appreciative of all the support and the collaborations I’ve enjoyed with all my clients this year. Thank you! Monday is the MaltaPost’s Christmas delivery deadline for shipping to the USA, although it’s not like packages sent after the December 1 will fall off the planet (I hope)…they’ll still get delivered, just not guaranteed by Christmas. I have checked into FedEx and their minimum charge is €78. Crazy! But back to being thankful…we are beginning our celebrations with Bramley Apple Pie, which is a British variety and I have a Bramley tree in my garden in England, so I was thrilled to be able to get a pie here. We were going to do the big dinner thing tonight, but Rahdo was up till 5am this morning doing a live interview and so our day kinda got off to a skewed start. No problem. We’ll bookend Thanksgiving with the Apple Pie, starting with dessert tonight (and in fact, the oven’s just beeped, so we’re 10 minutes from Pie!) and we’ll start breakfast tomorrow with American bacon (given to us from US Military friends at Essen last month). Ahhhh, American bacon. mmmmm. And then dinner will be a whole baked duck, mashed taters, corn on the cob and finishing with the Bramley pie. Yum! Tastes of Home from all our homes. How fab is that! Wishing everyone a very lovely Thanksgiving, and a joyous start to the holiday season.